of crushed stone and tar. There were terrible injuries to the race car drivers and spectators. Cars caught fire, there were deaths, and the race was halted and cancelled when only halfway completed (five miles). Louis Schwitzer was declared the winner in front of 12,000 spectators. 1950: Curtis Turner qualified his Oldsmobile at 82.034 mph to win the pole for the inaugural Southern Five-Hundred at Darlington Raceway. Fifteen days of qualifying determined the 75-car field. 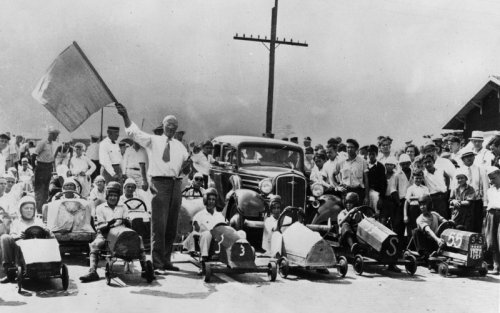 The quickest five cars each day earned a starting berth. 1973: Ronnie Peterson won the Austrian Grand Prix for Lotus ahead of Jackie Stewart and Carlos Pace. Niki Lauda missed his home race due to an accident at the Nürburgring 2 weeks earlier, where he injured his wrist. 1979: Rick Mears drove a Penske-Cosworth to victory in the USAC Championship race in Trenton, New Jersey, US. 1984: McLaren’s Niki Lauda took the lead in the World Championship with his 23rd career win at the Austrian Grand Prix. Second was defending champion Nelson Piquet in his Brabham-BMW, with Ferrari’s Michele Alboreto completing the podium in third place. 1986: Warren Johnson became the first NHRA Pro Stock drag racer to hit 190 mph at the end of the quarter-mile when he ran 190.07 mph at Indianapolis, Indiana, USA. 1999: Michael Schumacher got behind the wheel of his Ferrari for the first time since his crash at Silverstone resulted in a broken leg. He tested alongside Mika Salo and Eddie Irvine at the team’s Mugello circuit. He limped a little when he got out of his Ferrari after he completed one lap, but after a pause he drove four more laps. 2000: A 1964 Shelby Cobra Daytona Coupe was sold for $4.4 million, whilst a 1964 Ferrari 330 P3 reached $5.6 million at an auction in California. 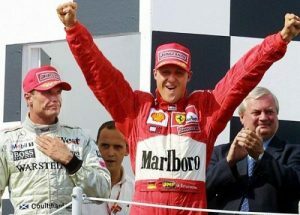 2001: Michael Schumacher won his fourth World Championship and equalled Alain Prost’s record of 51 Grand Prix victories at the Hungarian Grand Prix. Rubens Barrichello in the other Ferrari finished second and McLaren driver David Coulthard finished third. 2004: Sky Sports, the UK’s leading broadcaster of motorsport, signed an exclusive deal to televise A1 Grand Prix, the first of 30 networks to back the series around the globe. 1922: Three Fiats driven in turn by native Italians Felice Nazzaro, Pietro Bordino, Salamano, Enrico Giaccone and Evasio Lampiano became the first cars to run on the track at Monza, Italy. 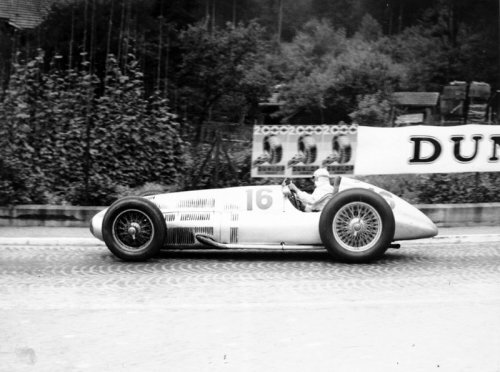 1939: The last major grand prix before World War II was staged at Bremgarten in Switzerland, and in a bid to lure the Italians into taking part and challenge the all-conquering Germans, the organisers ran the race in two heats, one for Voiturettes and one for GP cars, with the best from each going to a combined final. On a slippery track, Mercedes dominated with Hermann Lang, that year’s European champion, winning the race, three seconds ahead of Rudolf Caracciola, and German entries occupied the top six places. But the performance of Nino Farina, whose Alfa Romeo came seventh but ahead of several of the more powerful Mercedes and Auto Union entries, took the plaudits for a courageous drive. 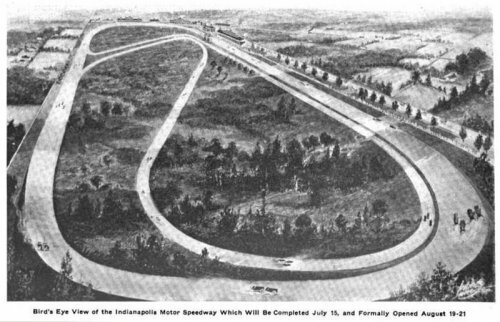 1948: NASCAR was forced to ­cancel a number of ­scheduled events due to an outbreak of polio in North Carolina, US. 1949: The first International Trophy at Silverstone was first run and won by Alberto Ascari driving a Ferrari 125 at an average speed o 89.58 mph. 1952: NASCAR issued a new rule that would reprimand drivers who were guilty of reckless highway driving. 1978: Pole-starter David Pearson passed Darrell Waltrip on the final lap to win the Champion Spark Plug 400 at Michigan International Speedway, clinching the last of 43 wins with the legendary Wood Brothers team. Pearson, who led 56 of the 200 laps in a Mercury, then held off runner-up Cale Yarborough by .32 seconds at the finish as Waltrip faded to third. There were 34 lead changes, including three in the final six laps on the 2-mile oval. So, How Do You Find Compatible Parts When Repairing Your Vehicle?